Located at the end of the north isle near the organ is our Wombell Ringing Simulator. 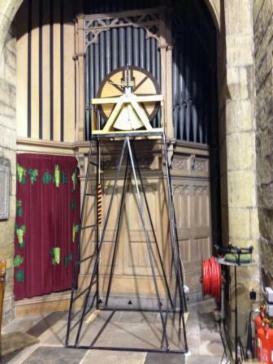 It was built by Saxilby Ringing Simulators and purchased with financial help from Sheffield City Council's Northern Community Assembly in February 2013. It must only be used under supervision of one of our ringing teachers. We would like to thank the ringers at Swaffham, Norfolk for their help in obtaining this simulator for us.